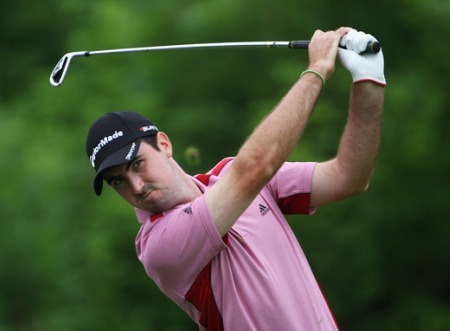 Royal Dublin’s Niall Kearney did well to finish just six shots off the pace after the first round of the inaugural Gujarat Kensville Challenge, the first event of the 2011 Challenge Tour season. The 22-year old Dubliner, who regained his full Challenge Tour playing rights by completing all six rounds at the European Tour Q-School, fired a one-over par 73 at Kensville Golf Club in Ahmedabad in northeastern India despite racking up what could have been a damaging triple bogey midway through his round. Starting on the back nine on the course designed by three-time European Tour winner Jeev Milkha Singh, Kearney birdied the par-five 14th before taking a seven at the 430-yard 18th. But the former Walker Cup player dug deep on the way home, following a birdie at the fourth and a bogey at the par-three fifth with a closing birdie four. Kearney finished the day tied for 23rd place and six shots adrift of Bangladesh’s Siddikur Rahman, who carded a bogey free, five-under par 67 to lead by two strokes from England’s Daniel Denison, Austrian Florian Praegant and Portugal’s Ricardo Santos. “I played two practice rounds and the Pro-Am and hence was primed before the event,” said Rahman. “When I went out, I just thought of keeping the ball on the fairways as there are so many out of bounds on the course. Rahman is one of a number of young Bangladeshi players emerging on the international golfing scene, and he believes it is no coincidence that he and his countrymen are developing at a rate of knots, given the junior programme he came through in his homeland. The chasing pack is led by Denison, whose career – and indeed life – was in jeopardy after he was involved in a serious car crash in 2007. But having returned to full fitness the young Englishman is rebuilding his career, and will have been encouraged by a round of 69 which was marred only by a double bogey at the par three fifth hole. Denison was joined on three under par by Santos, whose first gain came at the fourth hole, where he hit a nine iron to four feet and rolled in the putt. That birdie was soon cancelled out by his only blemish of the day at the next hole, where he three-putted from long range. But the 28 year old made amends after the turn, running up successive birdies on the 12th and 13th holes courtesy of putts from three and ten feet respectively. Another birdie on the 16th hole, where he pitched his seven iron to ten feet, saw Santos come home in 33 to join Praegant in a share of the lead. Like Santos, Praegant also took advantage of the shorter back nine to join the Portuguese player in a share of second place. After turning in one over par the Austrian might have feared the worst, but he stormed back with birdies at the tenth, 12th, 14th and 15th holes to surge through the field. 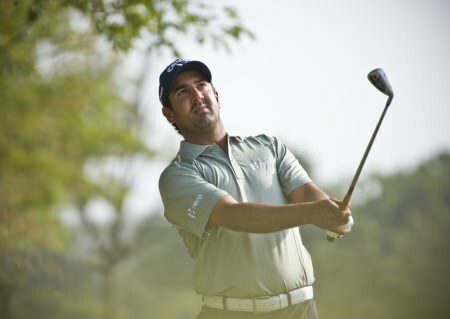 India’s Gaganjeet Bhullar, one of the host nation’s brightest prospects and twice a winner on the Asian Tour, is well in the hunt on two under par, alongside the Scandinavian trio of Sweden’s Klas Eriksson, Norwegian Espen Kofstad and Dane Mads Vibe-Hastrup. 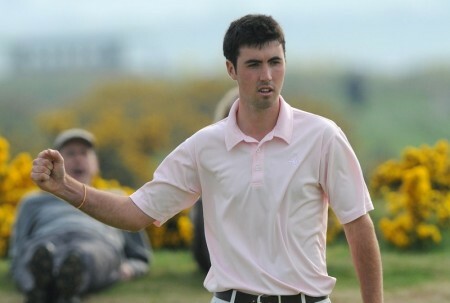 Niall Kearney needed hospital treatment for a nasty bout of food poisoning which forced him to withdraw before the second round of the inaugural Gujarat Kensville Challenge in India.